European institutions were designed to direct flows of global capital. In doing so, they’ve become less accountable to people. But in this gap between people and their institutions, citizens are rising up to reclaim the commons. The ubiquity of social unrest and economic conflict in Europe tells us that we are living in times of intense contradictions. Where streets have not filled up with massive protests calling for a more direct, participatory and meaningful democratic culture, ballot boxes are increasingly filling up with votes for post-fascist parties like the National Front or UKIP, whose voices are in turn amplified and over-represented by consistently high voter abstention rates. Though many are looking to the rise of new parties like Syriza and Podemos for signs of hope, the gap between the idea of Europe as a common, borderless space of emancipatory potential and the threat of a Europe characterised by nationalist entrenchment remains a daunting reality. Over the last few years, the Doc Next Network has been researching, documenting and playing in this gap, and building an archive of short, socially conscious documentaries and independent films in the process. During the first phase, called Remapping Europe, we explored the contours of Europe’s borders, whether these were internal between member states, external to the common area or inherent in the very idea of Europe. We learned that borders are something we carry with us; they continuously shape the structure and texture of our surroundings by imposing and reproducing relationships of exclusion and exploitation. As the political and social theorists Sandro Mezzadra and Brett Neilson point out, they are not mere obstructions of global flows of capital. Rather, they are the essential devices through which these flows are articulated, mediating social relationships and access to the most basic resources required to satisfy human needs, such as land, labor, money and knowledge, often referred to as “the commons”. This insight led to the project’s next phase, called Radical Democracy: Reclaiming the Commons, which looks at how borders operate at a more local level to enclose the commons and how those enclosures are being confronted and overcome. In this series of posts, we will present some of our results along with content from our Media Collection. By doing so, we will explore the challenges faced by ordinary people who are working together to produce an emancipatory horizon of self-organised and self-managed commons, free from the mediation of both the state and the market. The challenges faced by these movements are many. The enclosure of the commons is not limited to the privatisation of public resources, though this is certainly one of the forms in which it takes place. Enclosure goes beyond the transfer of resources to produce two major tendencies: closing in and crowding out. Think of the internet. Ostensibly, it is conceived to allow any user to connect with any other user or set of users anywhere in the world to exchange information in real-time. Many of us still remember how, around the turn of the century, several notable and enthusiastic intellectuals referred to an obliteration of the tension between time and space that would eventually lead to radically horizontal social relations. Of course, the reality of the internet is more complex than that. In a recent essay, net artist and co-founder of the Geocities Research Institute Olia Lialina describes how the field of User Experience (UX) has changed the way people use the internet over the years. Premised around “scripting the user”, UX directs what information we consume, what users we relate to and how, eliminating clicks by relegating more and more processes to the back-end of websites and applications (where they run automatically) and directing those we do make through a streamlined, visually attractive front-end. If we think of a company such as Facebook, the tendency towards enclosure becomes even clearer. In addition to information about the people we interact with, Facebook’s algorithms are constantly collecting data on our behavioural patterns, preferences and tastes. The algorithms, in turn, determine what stories we see in our feeds and what is marketed to us. Each click determines the next several, reproducing and reinforcing our previously existing interests and shielding us from the influence of those whose interests diverge from our own. In this way, we are closed into increasingly specific interest groups and crowded out of a forum for interaction with a much more varied multitude. Meanwhile, people all over the world are coming to believe that Facebook actually is the internet, and more and more companies and institutions are submitting an increasing share of their social activity to the logic of a single company. City space, with its human propinquity, distinctive neighbourhoods and humanly scaled politics—like rural space, with its closeness to nature, its high sense of mutual aid and its strong family relationships—is being absorbed by urbanisation, with its smothering traits of anonymity, homogenisation, and institutional gigantism. The result is that the ego itself tends to become passive, disembodied, and introverted in the face of a technological and bureaucratic gigantism unprecedented, indeed unimaginable, in earlier human history. Public life, already buffeted by techniques for engineering public consent, tends to dissolve into private life, a form of mere survivalism that can easily take highly sinister forms. Bookchin also linked the emergence of a market economy, freedom of trade and industrial innovation in Europe to the development of roads, rivers and canals. The French from ZEMOS98 on Vimeo. Tellingly, while the latter were systematically homogenised, redirected and, in the case of the rivers, polluted, the former are precisely the elements that were prioritised throughout the development of the European Union, beginning with its roots in the European Coal and Steel Community. While there is much to be said about his idealisation of rural communities and pre-capitalist society in general, reading The Rise of Urbanization and the Decline of Citizenship today is an illuminating experience. His agenda for community-based, libertarian municipal politics matches the demands of the radical democratic movements that took center stage in post-2011 Europe, while the Troika imposed austerity through the sheer force of its own “institutional gigantism”. And his critique of urbanisation resonates with the pathological geographies of the housing and construction bust of countries like Spain and Ireland. 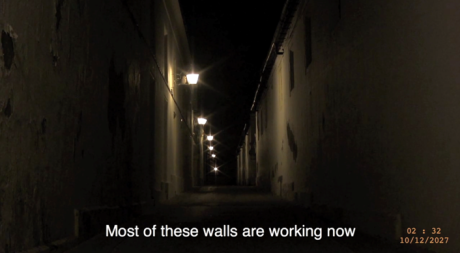 NONCITY, an independent film by Nuno Pessoa and Andrea Fernández, captures Bookchin’s critique of urbanisation at the expense of the city as it follows two visitors wandering through Arroyo de la Encomienda, a Spanish ghost town on the outskirts of Valladolid left behind by speculative town planning and corruption. Its mayor resigned a year after being charged with bribery and obstruction, once he had been sentenced to three years of prison. NONCITY from TNGNT on Vimeo. We are beginning to see the cracks in the pavement. Seemingly small gestures can provoke widespread revolt, whether it is cutting down a tree in Istanbul or evicting a squat in Hamburg or Barcelona. Mainstream publications like The Guardian are beginning to run articles on the commons, heralding “a wave of disruption” that will challenge neoliberalism. And the politics of urbanisation now generates considerable interest, with prominent blogs and web magazines dedicating considerable space to polemics on Richard Florida’s creative-class oriented approach to “urban renewal” or Neil Smith and David Harvey’s critique of gentrification and city branding. We are also seeing the rise of what I’d argue has become a sub-genre of internet literature, namely, the pseudo-Marxist think-piece on hipsters and gentrification. Most importantly, we are seeing more and more attempts by ordinary citizens to take back what is rightfully theirs, what is rightfully everyone’s. Over the next several weeks, we will tell some of those stories. It’s true that we are not going to change the world with one or two urban gardens. But when we care for the seeds planted in the gaps of a hollow system, we are choosing to cultivate the living city and leave the dead weight of urbanisation behind. And who knows what may tremble beneath the cobblestones? Municipal Tremors - Radical Democracy: Reclaiming the Commons teaser (Spain Medialab) from Doc Next Network on Vimeo.